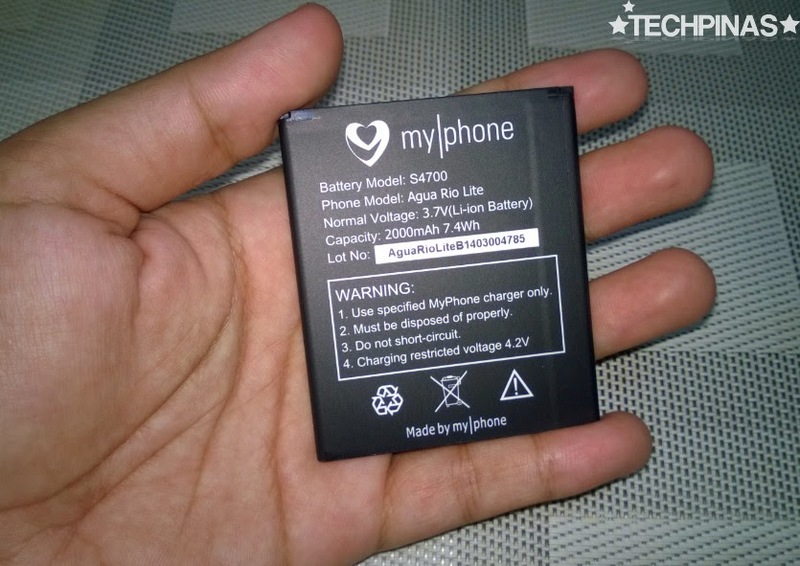 MyPhone Agua Rio Lite Initial Review, Unboxing, Antutu Benchmark Score, Sample Camera Photos, In the Flesh Shots! 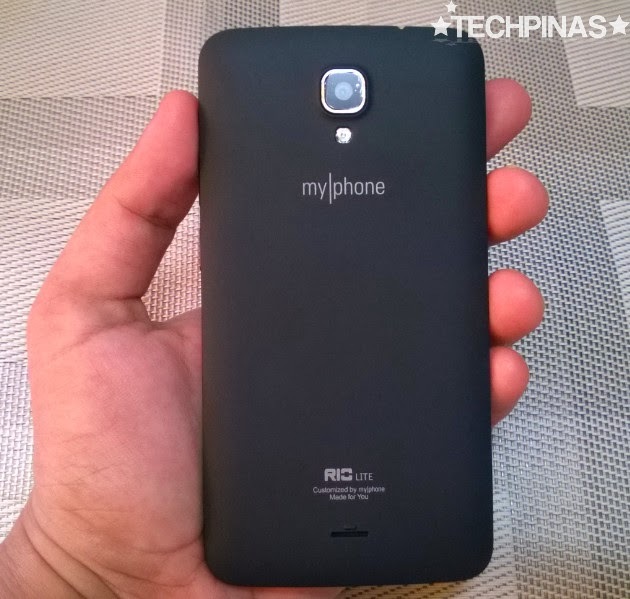 Hot on the heels of MyPhone Agua Rio's highly successful launch and overwhelming success in the market, the local electronics giant recently released its even more affordable follow-up to that entry-level monster best-seller. 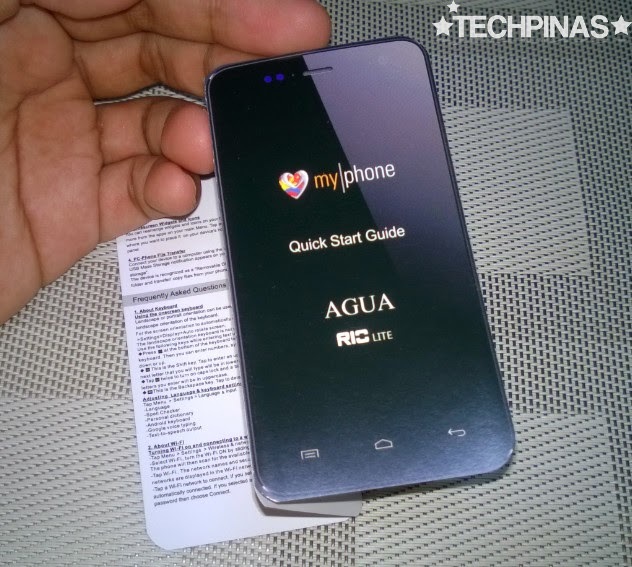 Donning an SRP of Php 3,999, MyPhone Agua Rio Lite is a thousand bucks more affordable than its direct predecessor but - having played with the device for a week - I find that although its cheaper, Lite is by no means a push-over when it comes to looks and performance. 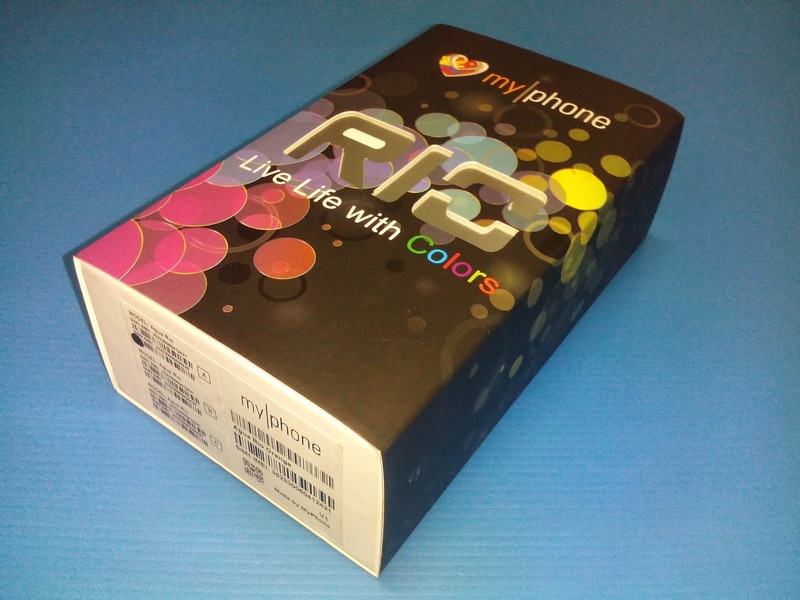 Before I show you the device itself, let me share with you Rio Lite's packaging and all the accessories that join the phone inside the box. As you can see, Lite comes with a simple white paper box with a photo of the device in all color variants printed on top. At the bottom, we'll find Solid Service Center's Hotline number - (02) 4568888 - which comes in handy should the consumer require after-sales service for the smartphone. 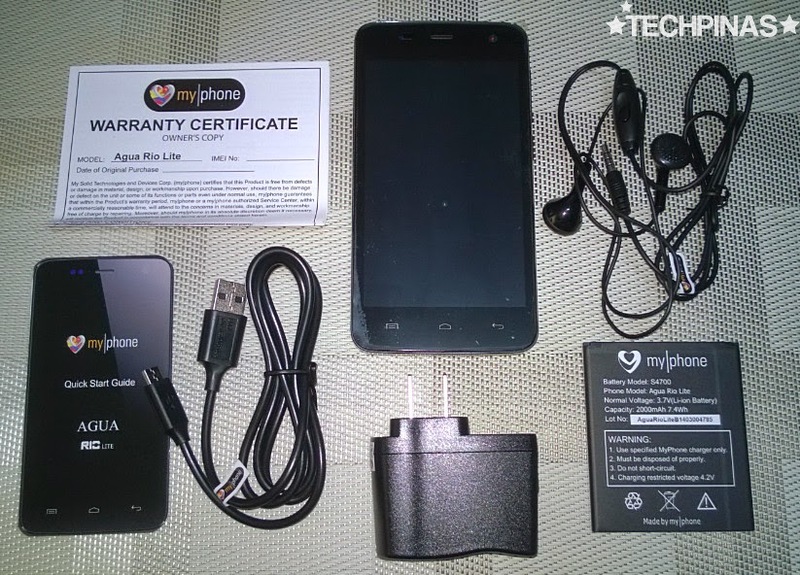 On the left side, MyPhone printed some of Rio Lite's key - albeit not all too detailed - technical specifications including the 4.7-inch display, 5 MegaPixel main camera, 2 MegaPixel front cam, 1.3 GHz Quad Core processor, 4 GB of ROM, 512 MB of RAM, and Dual SIM capability. 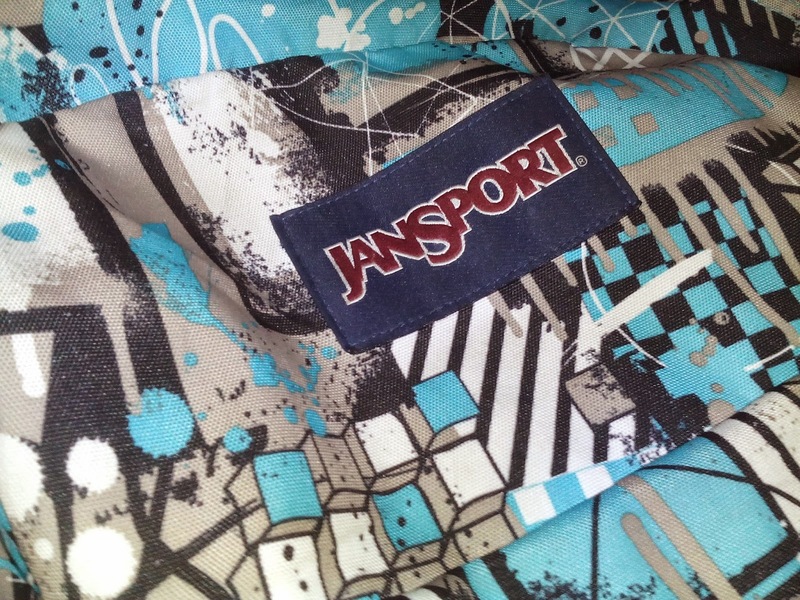 Lifting the cover, we'll find these items. 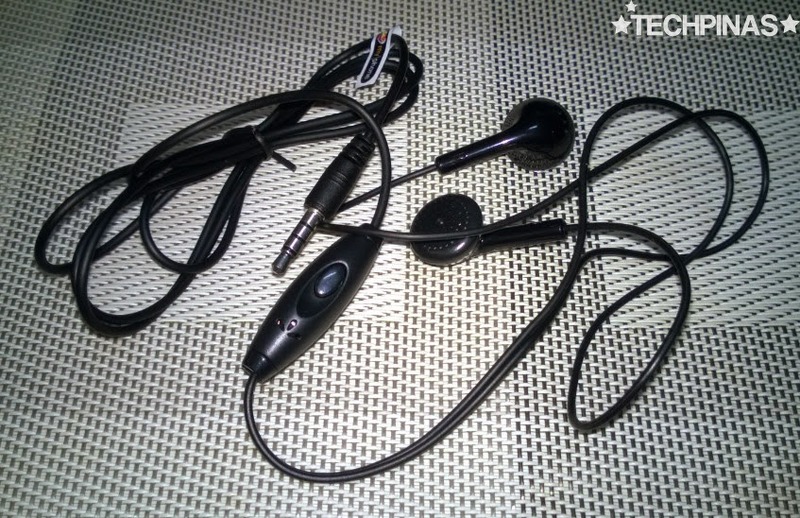 There's the standard earphones with microphone, which means that you can use it to talk to someone during calls. 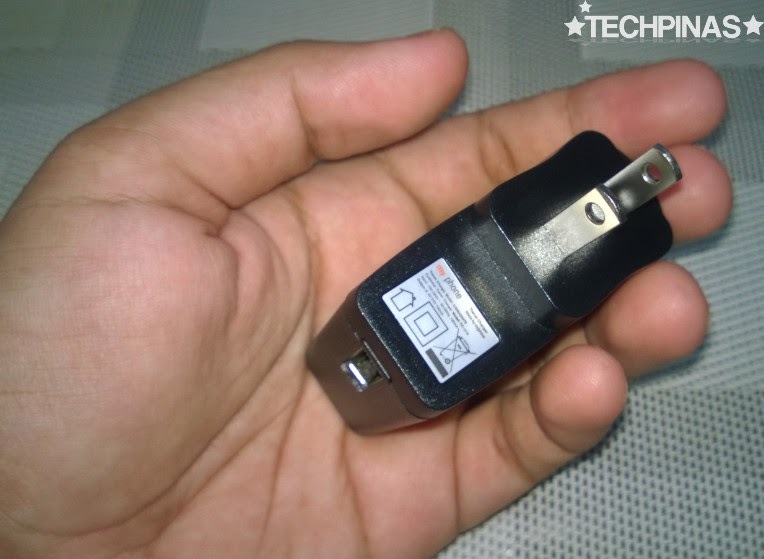 The travel charger that's small enough to fit in the pocket should you want to bring it with you anywhere you go. 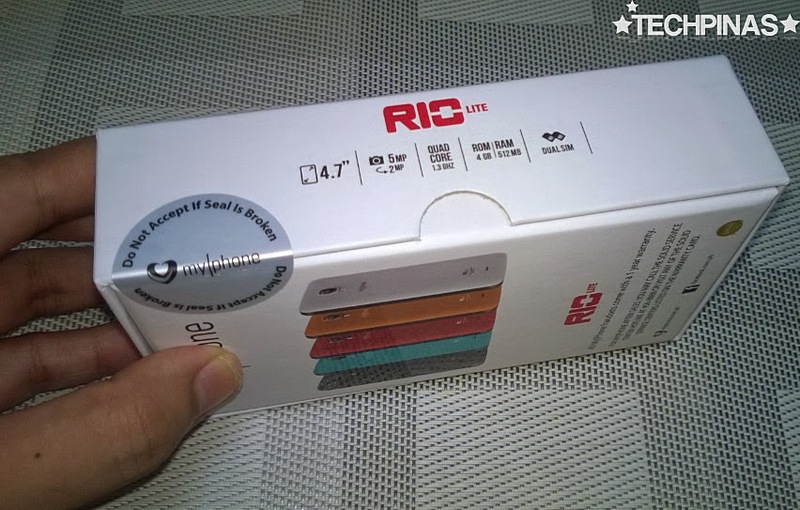 The 2,000 mAh Li-Ion battery pack that gives Rio Lite around 10 hours of uptime with mixed usage including shooting around 30 photos, recording a 10 minute long HD video, checking and updating Facebook, Twitter, and Instagram, checking mails and browsing the web, playing non-specs intensive games for an hour, making around 20-minutes of combined voice calls, and sending around 50 text messages. 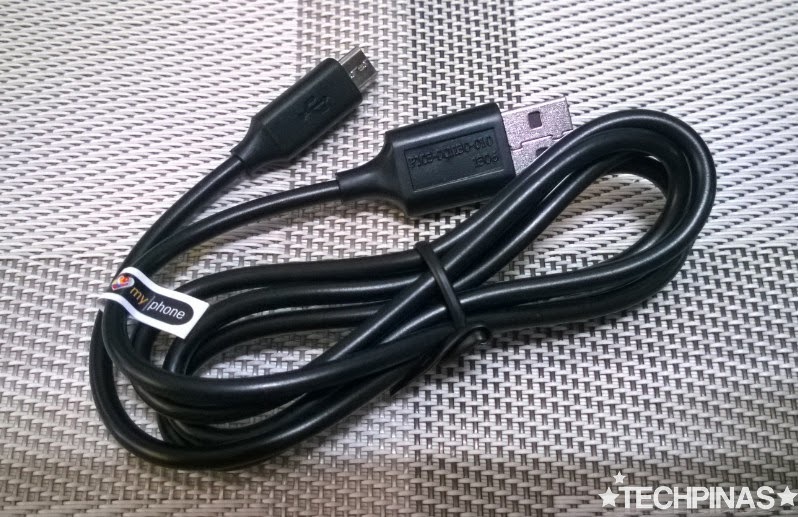 The microUSB to USB cable for connecting the handset to your PC or Mac. 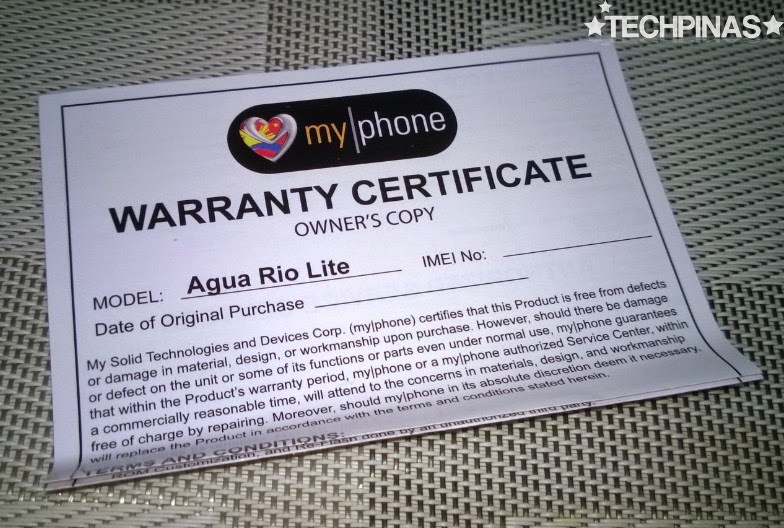 Of course, buyers will also get this warranty certificate that guarantees after-sales support for the MyPhone Agua Rio Lite. The product comes with 1-year service warranty. The Quick Start Guide, which - frankly - hardly anyone reads these days. 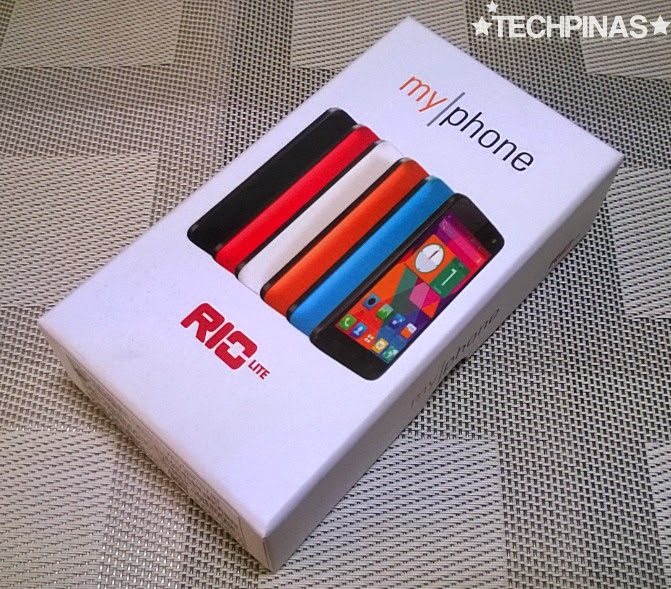 But hey, at least, MyPhone bothered to include one in the package. And that's all good! 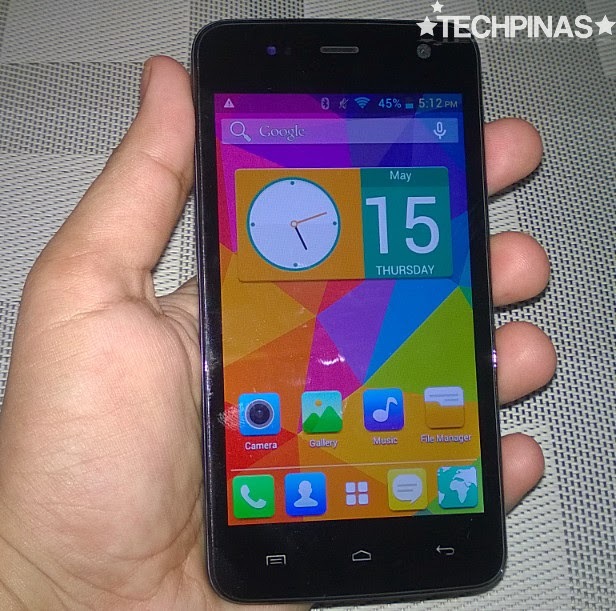 TP Friends, here's how MyPhone Agua Rio Lite looks in the flesh. With dimensions of 138.5 x 71.5 x 9.5 millimeters, the device is rather thin and slim; It fits perfectly in one hand (great for single-handed use) and slips seamlessly into my jeans' front pocket. 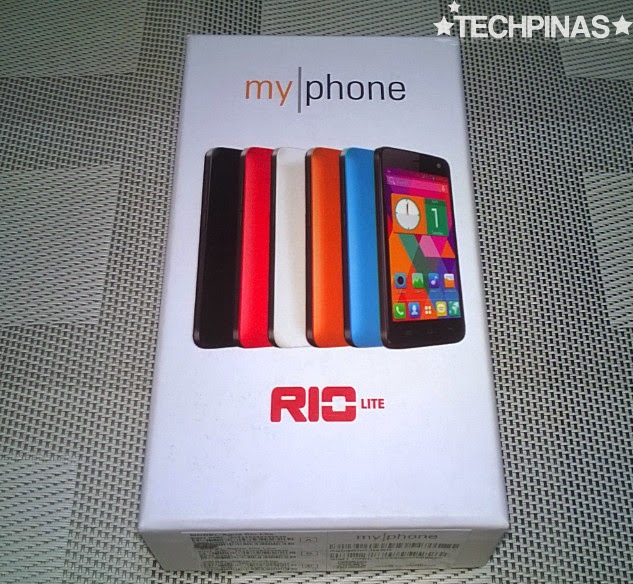 When Rio Lite was announced by MyPhone last April 29, 2014, one of my readers messaged me on Facebook and asked me, "Sir Mark, do you think this phone will look as good in person as it does on press photos?" I answered, "Of course, I will have to see the device in the flesh first then I'll let you know." Well, now that I finally own one, let me tell you: The handset looks as cool and nice in person as it does on posters and billboards. 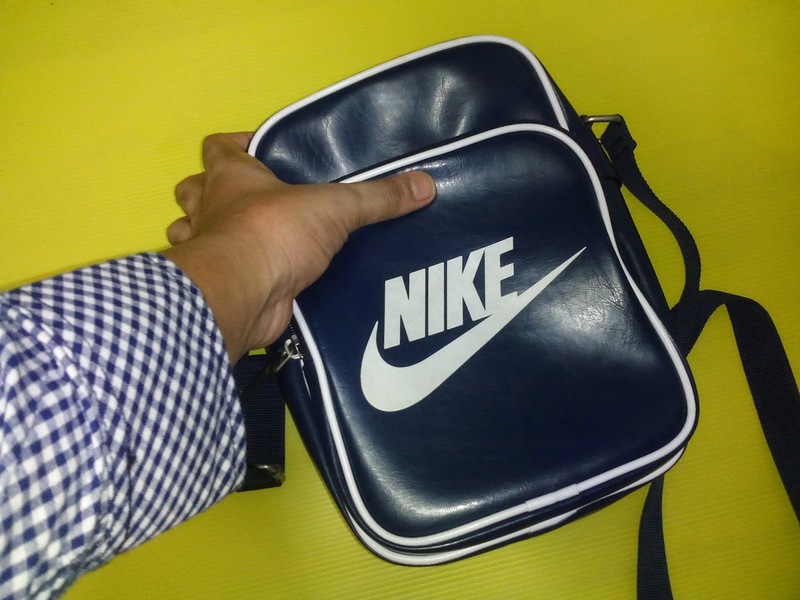 If anything, I think most young Pinoy gadget fans will find it quite cute. 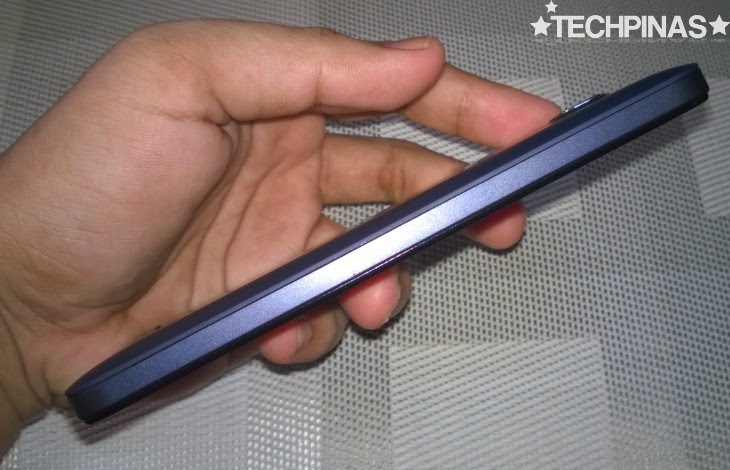 At the back, we'll see phone's 5 MegaPixel autofocus camera and HD video recorder module with LED flash near the top and the (surprisingly good) loud speaker at the bottom. 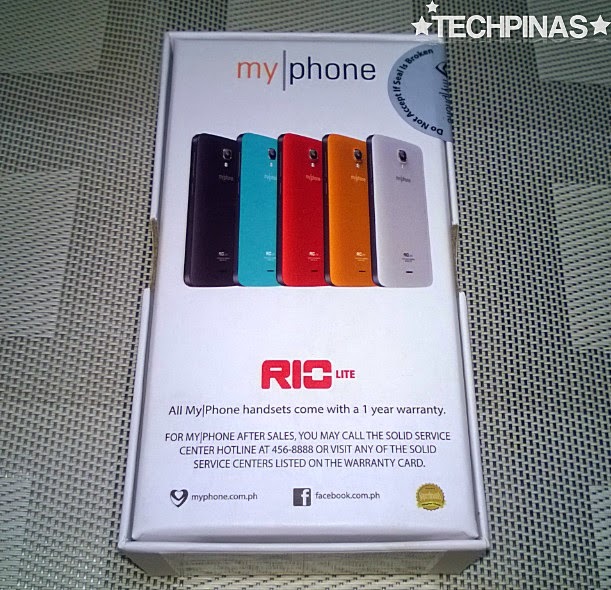 Whereas the regular Rio has a polycarbonate unibody shell, the Lite version flaunts a removable back plastic plate with matte finish. In fact, design-wise, that's the biggest difference between the two entry-level releases. 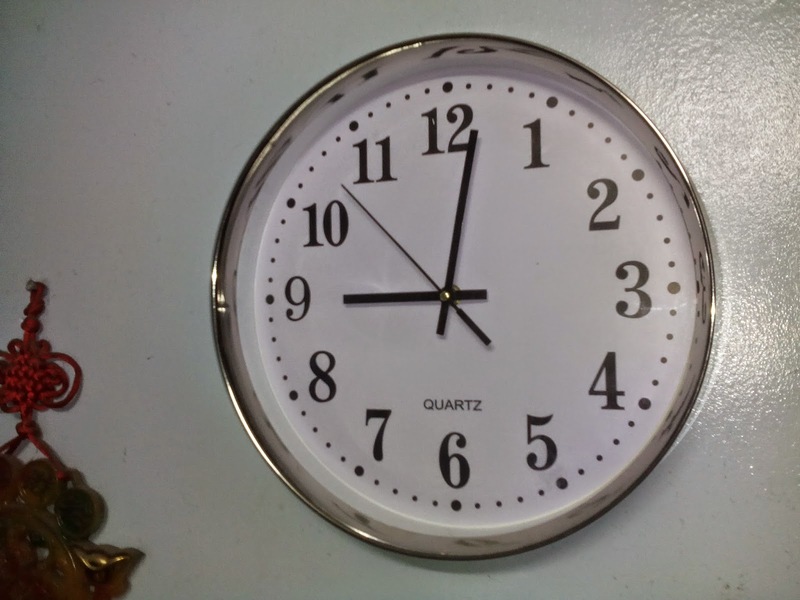 Here are some shots that I took using Rio Lite's 5 MP shooter with indoor lighting. Kindly click on the photos for larger view. I know these are few; I will add more in the coming days. Needless to say, the quality of the photos are nothing to shout about. Details look crisp but the images are somehow lacking the vibrancy and brilliance that we are used to seeing on shots taken using high-end smartphones. 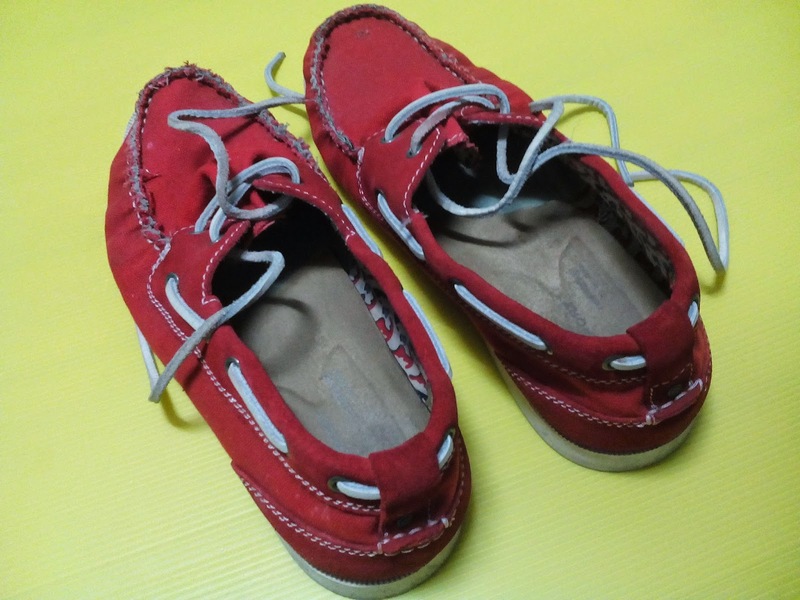 Nevertheless, if you ask me, these are good enough from a device in this price echelon. Also, I have to commend MyPhone for the snappy focusing capability of Rio Lite's camera -- reminiscent of the regular Rio's. The power button - just like the volume rocker - is located on the right side of the phone, which I like since I can use my thumb to easily turn the screen on while holding the phone with one hand and not have to reach for the top panel of the device where the power key of some handsets is inconveniently located. As you can see, the phone's camera module - with its metallic rim - is protruding at the back, which could make it a scratch and dent magnet. I would suggest that you purchase a silicon case along with the handset to protect it - especially that part - against the knocks and bumps of daily use. 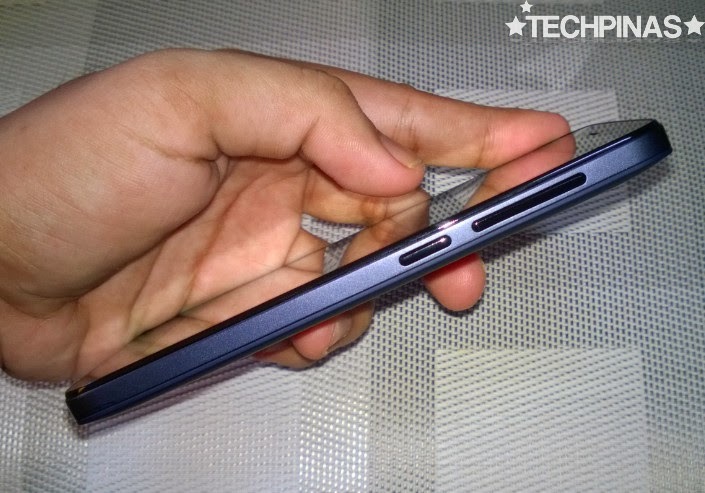 The microUSB port and 3.5mm audio jack are located at the top of the device. I would have preferred to see them at the rear but it's alright. No biggie. MyPhone Agua Rio Lite features a 4.7 inch WVGA 480 x 800 pixels IPS display, which looks bright and brilliant regardless of the viewing angle. The 2 MegaPixel front cam can be seen above the screen while below, we'll find the touch-sensitive Menu, Home, and Back buttons -- in a row, in that order. 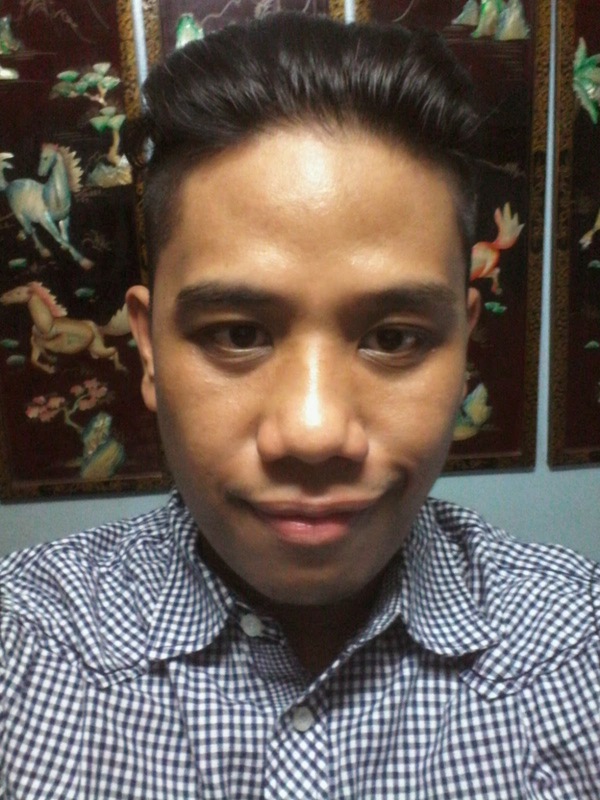 That's a #nofilter selfie I took using the 2 MegaPixel front cam with indoor lighting. I don't think the module has a BSI sensor in it but I find the quality of the resulting shot to be quite acceptable. Anyway, I'm really moreno and I think Rio Lite got my skin tone just right. I know, 400 x 800 pixels screen resolution is rather low these days -- especially when you compare it to the HD display of the regular Rio. 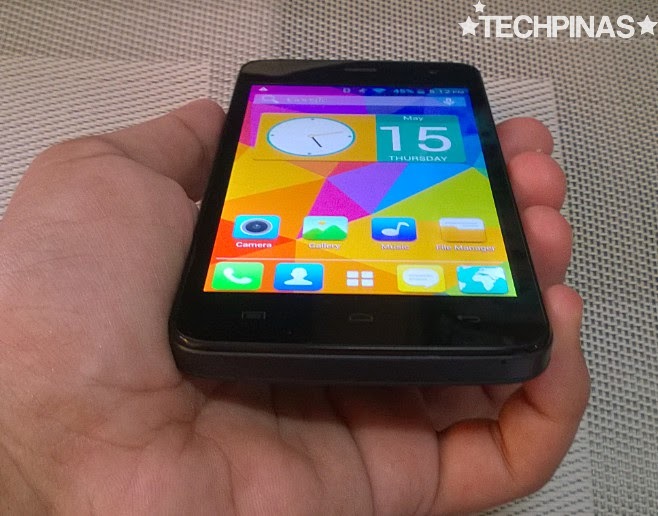 Nonetheless, Lite's display quality is far from horrible and actually looks quite appealing. 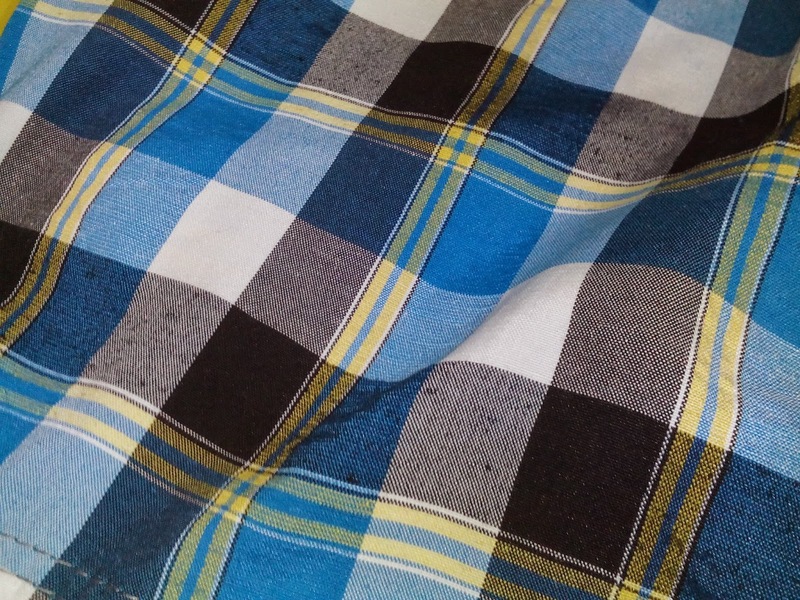 Sure, it's not as crisp as that of its predecessor but it's definitely not pixelated nor blurry. Inside the shell, MyPhone Agua Rio Lite runs Android 4.2 Jelly Bean operating system with its 1.3 GHz Quad Core ARM Cortex A7 CPU and 416 MHz Mali-400 MP2 GPU based MediaTek MT6582M SoC, handles multitasking with 512 MB of RAM, and has 4 GB ROM that can be beefed up via microSD card slot supporting up to 32 GB. 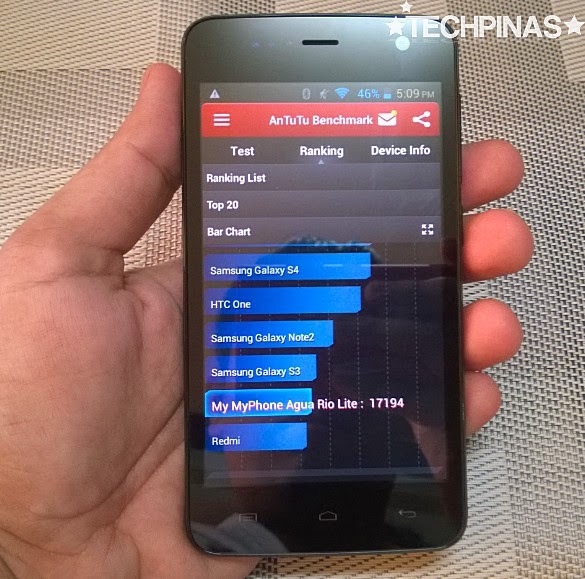 The combination of these innards give the handset an Antutu Benchmark Score in the area of 17,194. 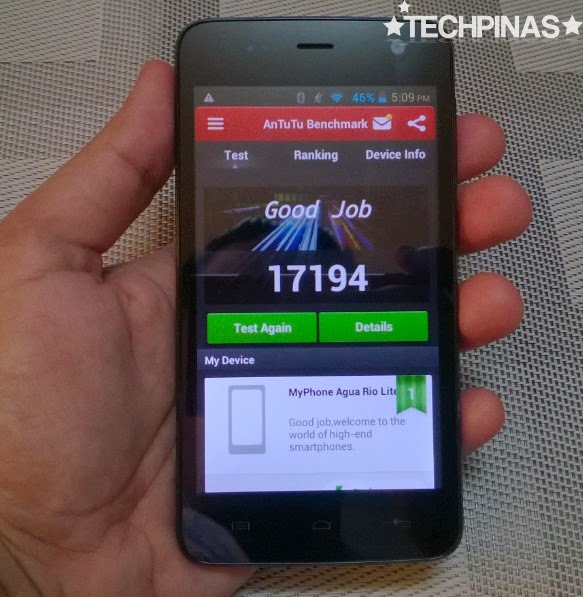 This Antutu score supposedly puts the MyPhone Agua Rio Lite in between flagship releases Xiaomi Redmi and Samsung Galaxy S3 in terms of overall performance. For me, this high mark is well reflected in the smooth touch response and screen transitions that get when I play with the phone. I think the MT6582M chipset hardly struggles in displaying graphics on the mere 480 x 800 resolution display. As for gaming, I've run non-specs intensive titles on the phone including Temple Run 2, Flappy Bird, Maleficent Free Fall, Raging Thunder 2, and Subway Surfers and MyPhone Agua Rio Lite delivered a stutter-free experience. So off hand, what's the TP Verdict? 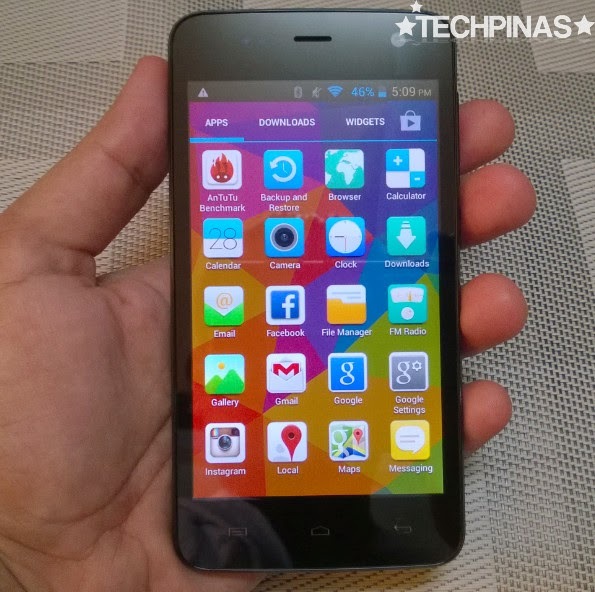 MyPhone Agua Rio Lite only costs Php 3,999. When you consider that and all of the phone's capabilities, it's really hard to pounce on the product and say that it's a lackluster release. Sure, its dual cameras could be better (as you all know, I'm very particular about my daily phones' imaging capabilities) and its screen could be bigger and more crisp. But the truth is, even without donning those suggested improvements, this phone already gives you far more value than the money that you will take out of your pocket to purchase it -- if you can keep your expectations in check. In my book, that makes a good product; One that I will be proud to recommend. 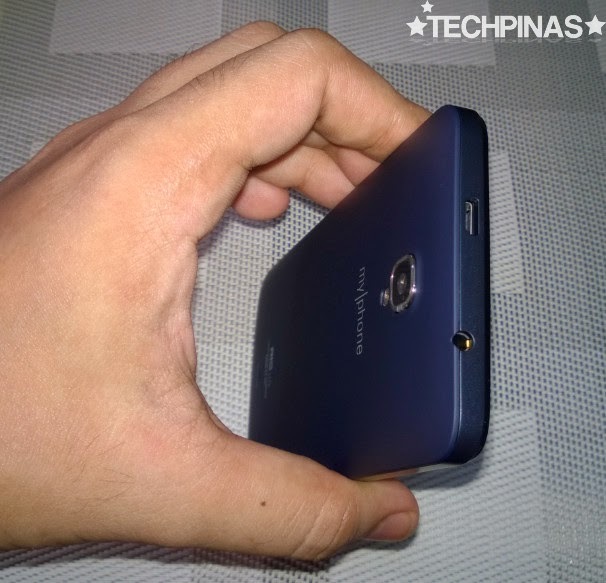 Thumbs up, MyPhone.